Alison Haislip, host of The Geekie Awards, toasting a successful first event. 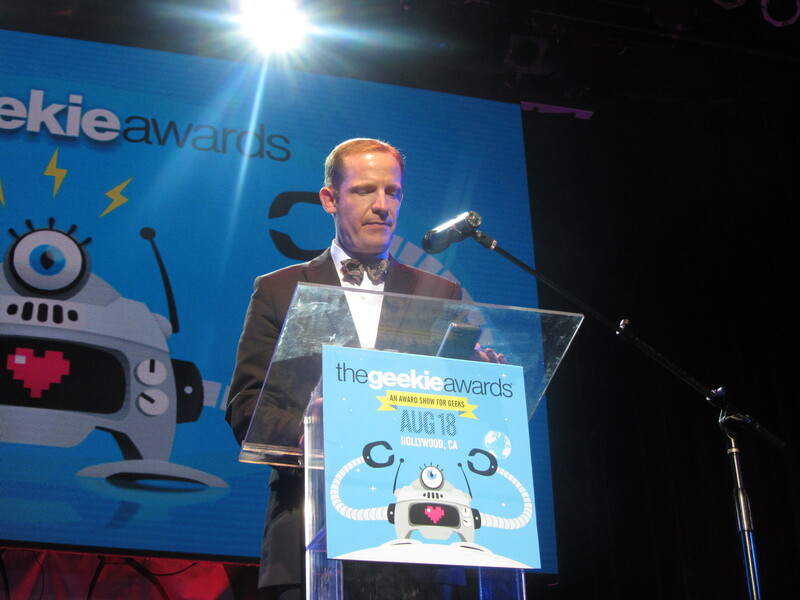 The Geekie Awards was a tour de force of talented professionals who excel at being Geeks. 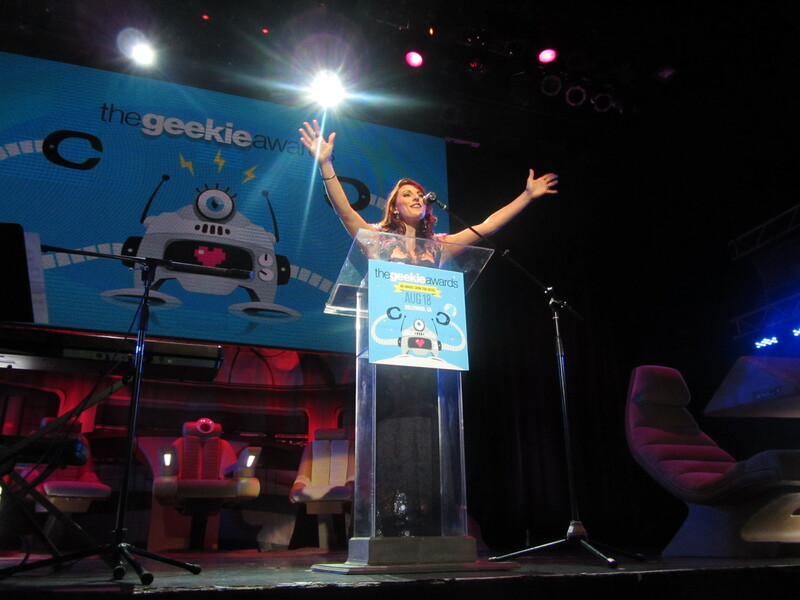 The Geekie Awards was organized by Kristen Nedopak and her very talented team. 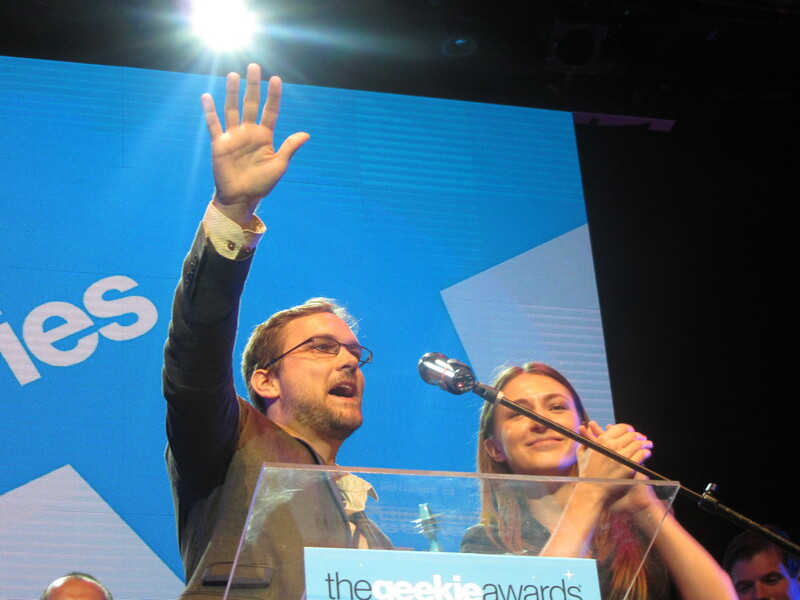 The awards show was the first of its kind recognizing “geeks.” The event sold out and the show was trending on Twitter above the season finale of True Blood. There has yet to be a legal conference with that much energy. Miracle Laurie poking fun at Kristen Stewart. I was grateful I ordered my tickets early. We were at Table 2. Right under the podium. Best seats in the house. Kristen Nedopak’s “Thanks Mom” Moment. 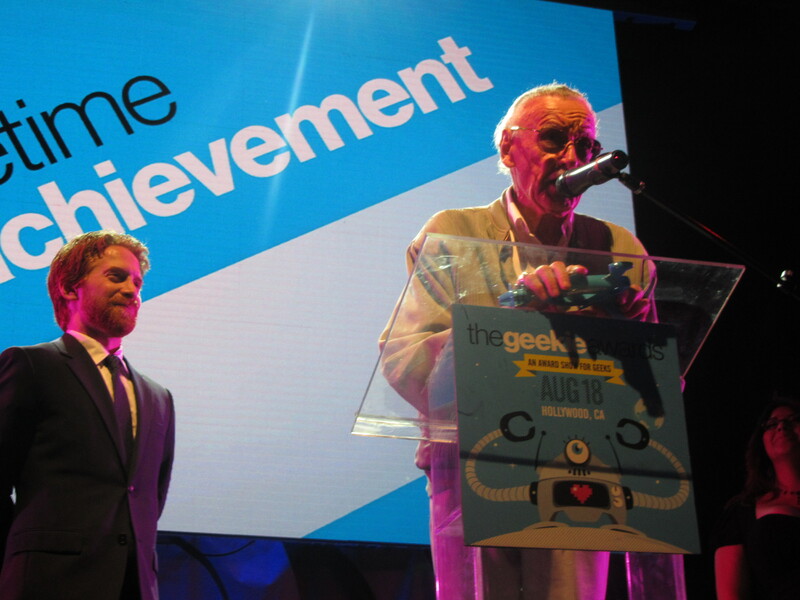 The Geekie Awards opened with Seth Green presenting Stan Lee the Lifetime Achievement Award. This was followed by recognizing NASA JPL for their “Geek Cred” for landing Curiosity on Mars. Yes, Flight Director “Mohawk Guy” gave a nice speech. Stan “The Man” Lee and Seth Green. It is tough to imagine who will be honored next year for the Lifetime Achievement Award. Lucas? Spielberg? I do not envy the selection team. It is a shame Ray Harryhausen is no longer with us. There is a man who inspired generations of Geeks. Nothing but respect for Marc Evan Jackson’s bow tie choice. Madeleine Holly-Rosing, author of the comic mini-series the Boston Metaphysical Society. Both BMS and The Legal Geeks had honorable mentions. Next year, we hopefully will be nominees. Yes, I am wearing an original “I Like Ike” button from the 1952 Presidential Election. I cannot express how I was in awe of the talent of the nominees. From the creativity of the short film Undying Love, to the talent in Cosplay Piano, to the unmatched skill of One Carve to Rule Them All, you could respect the dedication all of these winners to have such geek perfection. 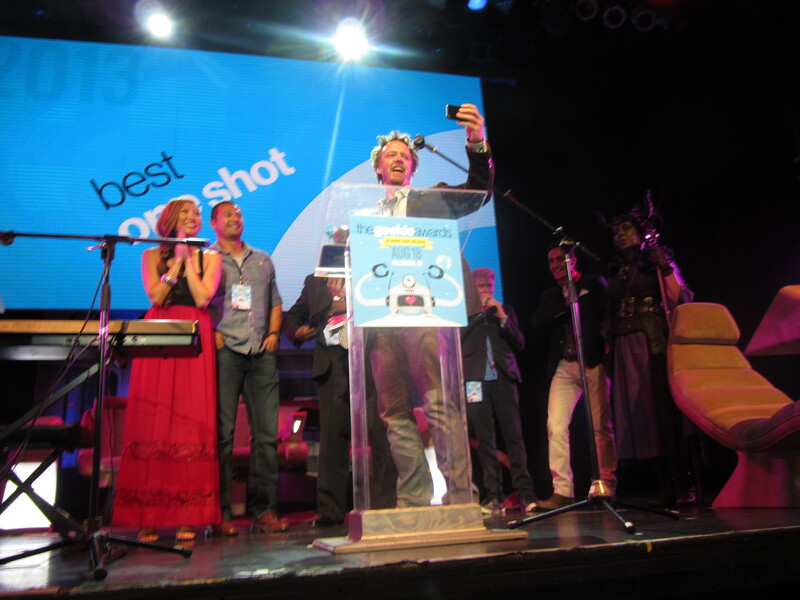 Nothing like a winner taking a photo of the attendees. All of the honorees showed exceptional humility and class to their fellow nominees. I strongly encourage check out all of the amazing work. The team from Cosplay Piano at the end of their acceptance speech. The Avalon was transformed into a Geek playground. R2D2 was on the Red Carpet. They had the Bridge of the Enterprise-D. Tons of amazing cosplay. For the record, yes, I brought my 3rd Doctor sonic screwdriver. On the Bridge of the Enterprise-D, apparently in a worm hole from the lighting. I’d love to do a Star Trek video podcast from there. 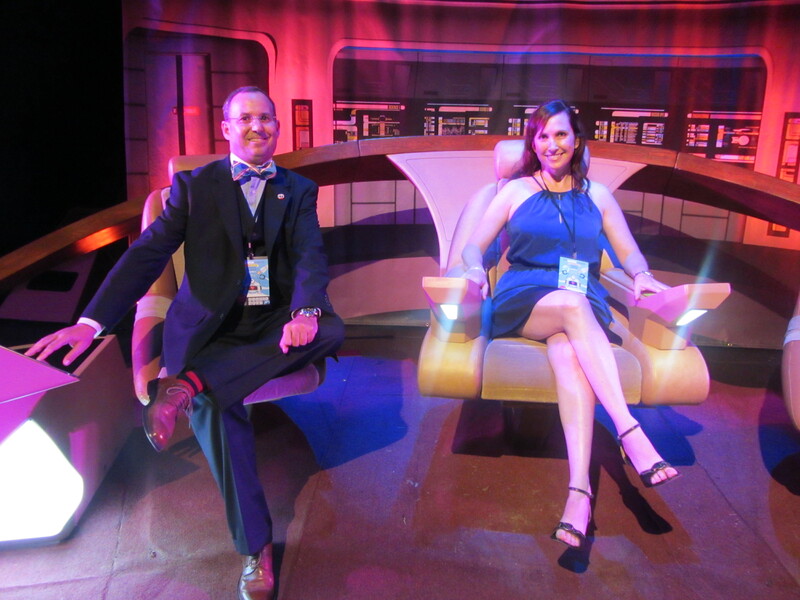 Yes, I was the gentleman and let my friend sit in the Captain’s Chair first. 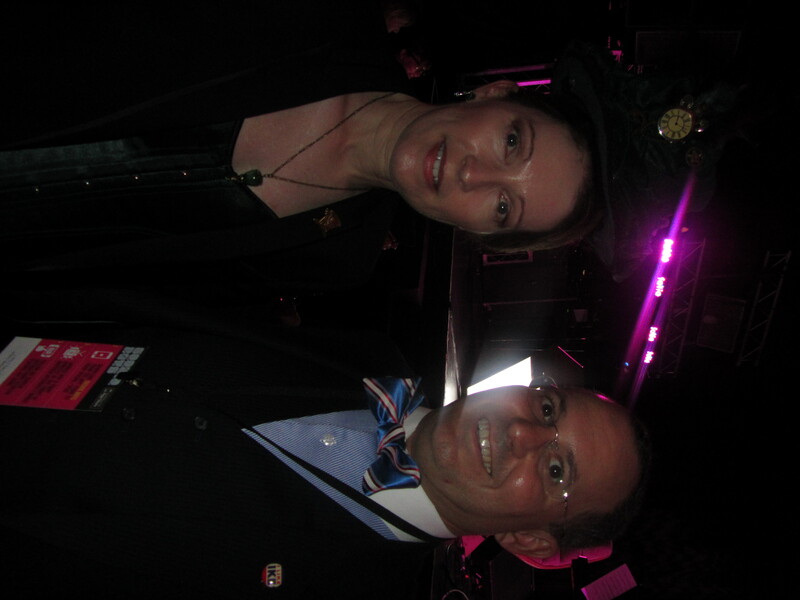 I was greatly impressed with The Geekie Awards. My good friend who accompanied me, also an attorney, described it as extremely fun. She wants to attend next year. My only suggestion for next year is for registering guests: 1) Have different colored signs for where people should line-up, because colors are easier to organize lines then having to read any text from a distance; and 2) Have registration tables labeled “A-G” and so on to ease the check-in process. Job well done. I look forward to The Geekie Awards: Year 2. Previous articleHuzzah: A Renaissance Fair Post!